Formed 1891. Wound up January 1966. Founder member of Division Three (North) 1921. Resigned 1962. It is believed that the club was formed as Stanley Villa FC and took its name from Stanley Street where most of the original members lived. In 1893, the club adopted the name of the town and a year later began to compete in the Accrington & District League. With the decline of Accrington FC, Stanley became the dominant club in the town and joined the Lancashire League in 1900, winning the championship in 1903 and 1906. Early records (1904) indicate only that the players wore red jerseys and "dark knickers" and it is a matter of conjecture if these were navy (as shown), black or even grey. In all likelihood, assuming that the players provided their own kit, various dark colours were probably used. With the outbreak of the First World War, Stanley were wound up. Thanks to the enthusiasm of an ex-player, Sam Pilkington, the club was resurrected in the Spring of 1919, acquiring a new ground at Peel Park and securing a place in the Lancashire Combination. In 1921, the Football League members were hesitating over forming a northern section of the Third	Division because of doubts over financial security. Stanley's officials proposed that applicants prove their viability by depositing a sum of money with the League Management Committee. This idea was accepted and Accrington Stanley became one of the founder members of the new division. Life in the shadow of the big Lancashire clubs was never easy and Stanley were to struggle throughout their existence, rarely finishing in the top half of the table. 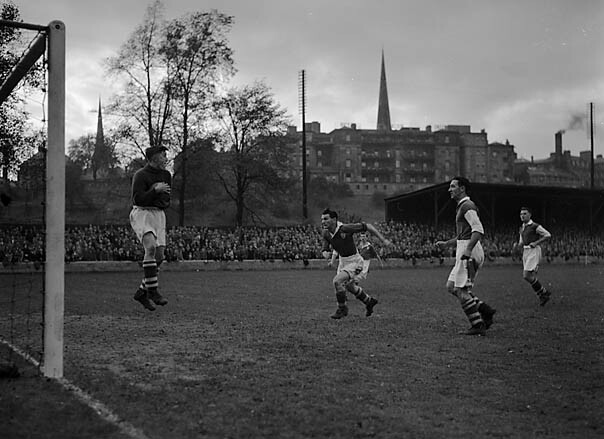 After the Second World War, the club survived two re-elections and hovered near the foot of the table but in the mid-Fifties their fortunes seemed to be on the turn as they finished second twice and third twice between 1955 and 1958 (only the champions of the two third divisions were promoted at this time). The club's crest appeared on players' shirts for the first time in 1954. Having been placed in Division Three when it was formed in 1958, Stanley started well but in 1960 the club was relegated in last place. Faced with mounting financial problems, the club sold players to survive. In 1961, the club dropped their traditional red shirts for a new playing strip but it proved a futile gesture. In December 1961, the club was banned from buying players because of their mounting debts. The severe winter caused the cancellation of all matches for three weeks, so no cash could be earned and when the weather eased, Stanley dropped to the bottom of Division 4 where they remained until the end of the season. The desperate board of directors brought in Bob Lord, the influential chairman of Burnley FC and a prominent member of the Football League Management Committee, to prepare a rescue plan. This was rather like entrusting your flock of sheep to the local wolf. Lord decided that the club would have to be wound up and on 5th March 1962 the directors announced that the club would resign from the Football League and all its assets sold off. The club struggled on with an amateur team and, in order to avoid further problems with creditors, was renamed Accrington FC. In 1966 during their second season in the Lancashire Combination, they finally closed down and Peel Park fell into dereliction. In 1968, a new club was formed and gradually rose through the non-League structure until in 2006 the new Accrington Stanley was promoted to League Two. (a) Accrington Stanley Has It A terrific site run by Greger Lindberg who has made a very significant contribution to this gallery.